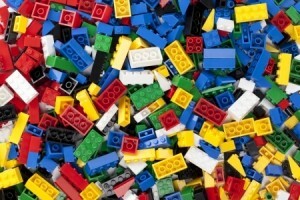 Bricks 4 Kidz » Did you know these interesting LEGO® facts? Ever wonder which LEGO® set has the most bricks? Which is the most costly? How many are produced each day? We’ve got the answers to some of your most pressing questions! Which set has the most bricks? The LEGO® Taj Mahal will keep you busy for quite a while. With the average set currently containing around 300 bricks, the replica of India’s Taj Mahal far exceeds that with its close to 6,000 bricks. No other set contains more pieces. Which set costs the most? Before the Taj Mahal was released, this Millennium Falcon set held the record containing 5,195 bricks. This one is even more intricate and complicated, and its recommended age is 16 or older. This set also holds the record as the most expensive set placed in stores, with a Manufacturer’s Suggested Retail Price of almost 500 bucks! Currently, Germans buy the most LEGO® Bricks, with the United States coming in second. What’s the best selling set ever? The LEGO® Mindstorms Robotic Invention System from 1998, along with its 2.0 version, released in 2001, have sold over one million sets worldwide. Used for fun and education, it’s a staple in engineering and robotics classes and workshops, including at Bricks 4 Kidz! How many LEGO® Bricks exist? Since they began production in 1958, over 400 billion LEGO® Bricks have been created. For reference, you could reach the moon approximately 10 times with all of those bricks stacked into columns! To keep up with the demand, they make over two million bricks per hour. That’s a lot of building. We better get busy!